There was a blog from Sweden that I loved – bjooti.net. I won’t link to it because I found out over the weekend that the blogger has shut down the blog and removed its archives. I couldn’t read Swedish of course – I’m not that linguistically inclined – but Google translator is a huge help, and her gorgeous pictures spoke for themselves. One of the reasons advanced was that it was just getting too much to keep pushing to stay in front – to be the latest with the newest news all the time (being one of the top European beauty bloggers, she was). It left her no time to herself because our blogs for many of us, are a hobby and after 3+ years she decided enough was enough. I’m sad about it of course – she was a lovely blogger, but it also made me think. I’m hitting that 3+ years bump – we’ll turn 4 in just 8 months! And I’ll be honest that the whole chasing for new news thing got overwhelming and has been overwhelming. I’m thankful of course, that I’m able to indulge in my little hobby, and thankful that I am being consistently fed with news about… you guessed it, the latest and newest, and I’m eternally grateful and thankful that so many of you out there find the information helpful and useful. But I’ve decided to make a little change here at My Women Stuff. It was a decision I made (and one I’ve implemented) before I learnt about bjooti.net but that was the little push I needed and I thought I’d tell you about it. 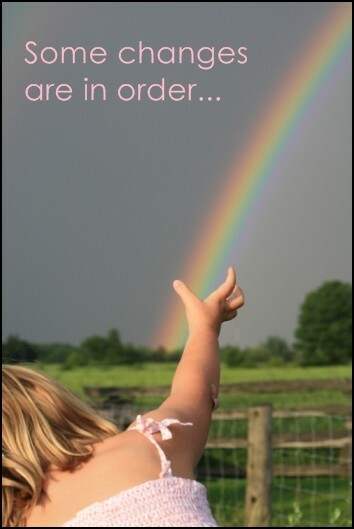 I’m making a conscious decision to stop chasing the rainbow – because you can never catch it, nor will you ever find the pot of gold at the end. If you do, it might just be leprechaun’s gold and evaporate overnight. I will still post about new and latest things in the beauty world that I’ve tried or come across, but it may not be “news” nor may it be “breaking news” by the time I post about it because you know, trying products, photography and writing takes time. If something new interests me off hand, I’ll be sure to share, as I have been doing. Maybe I’ll summarize it all into bite-sized snippets. I will continue to tell you about the things I try and the tips I learn. But, it may not be new or news or a “scoop”. If I receive a preview, so will you – but I’m not going to chase for it. What this also means is that you will not see posts about sales or offers on the blog. They will always be on Facebook and Twitter as and when I come across them – as I’ve done for a while. I will sometimes tell you about contests brands run or events where you can win stuff or get nice freebies, but it will be the exception rather than the norm. The biggest change might be that you may not see posts about upcoming makeup or beauty seasonal collections ahead of time – there are many many blogs out there with many many lovely pictures anyway. I am personally overwhelmed at reading about Fall news in June when the Summer collections are just hitting the counters. I will post closer to launch date if I feel so inclined, but like I said, I’m done with chasing the rainbow. One more change. I will still run giveaways. I know its the reason why so many of you are reading 😛 but there will be markedly fewer due to constraints on my time. Real work that pays the bills is going a little bonkers and yes, I have bills to pay. I wholeheartedly agree. This will always remain a hobby and the 9-5 job is the one that pays a bulk of the bills so it makes perfect sense that that job is the one that will take up more of your time. I’ve always wondered how you’ve done it. Posts that come up so promptly and yet you still have a social life. Perhaps now, it’ll be a better balance of a bigger social life! 🙂 You’ve achieved much in a short time and I think you should continue doing this while it’s still fun for you. The moment it becomes a chore, that’s when you might want to take a break. I found your blog by googling up the last Dior collections – you were the only one that had swatches! But now, I just click your newsletter link, whichever article that interests me, not necessarily new and upcoming stuff. Sometimes you crack me up and I love that 🙂 Keep it up Paris!! I ain’t going anywhere and hope you are not either! go PB go! as….out as i am. am i the last person on this planet who doesn’t catch up with latest news? :p so i love reviews more than latest news! Ahh…it is true what you said about chasing that pot of gold. Frankly, I take my hat off to you, I can’t imagine how you kept going owing to the fact that it is tedious keeping this blog up! I’ve never minded about the ‘newest’ or the ‘latest’. Being a student, I can only read about those things and only dream about getting them 😛 By the time I actually save up enough, I’d end up spending on something else! I’m glad you’re not shutting down because you’re my favorite beauty blog. I much prefer reviews instead of what’s latest/new anyways as we can see that the product works or not. My dear, you got me into the world of makeup and not the latest makeup collection. Well, I could always read about the newest in local beauty magazines, but I read you blog because I like it and its relevant to me. found ur blog when looking for make up brushes more than a year ago , since then been reading ur blog almost everyday. I must be the worst of beauty bloggers then cos I certainly don’t feature the latest. Some of those things just don’t interest me at all. I actually get tired reading so many blogs writing the same news too. Just go with you heart Paris. But if u earn enough from your ads, then it’s kinda funny to cut loose on extra revenue that help monetize ur site. I’m not quite sure I understand your point but thanks for leaving a comment. i think Tiffany thinks that blogs are huge moneymakers with extra revenue from ads making blog writers highly profitable. In reality, 99.9% of blogs barely make enough from advertising to cover the cost of running the website and a little bit of pocket money for the owners. Blogging being very lucrative is only true for a handful of people, and was much more common 5 years ago than now. Nowadays i think the only ppl getting rich off blogging are the ones that sell the courses to “ways to get rich quick by blogging”. Good for you for taking a step back and re-assessing 🙂 running a full time blog is exhausting and I can’t believe you’ve maintained it for so long!